We at Zoom are so proud when our video collaboration software is used by people to make the world a better place. That’s why today we want to share the story of the Senior Learning Network with you.Senior Learning Network is a mission-driven company focused on providing interactive video conferencing to senior residential and walk-in/community centers. 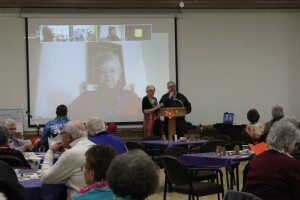 Through Zoom video meetings, the Network connects retired adults with educational institutions and experiences. What is the Senior Learning Network? This passion for life-long learning inspired the Senior Learning Network. 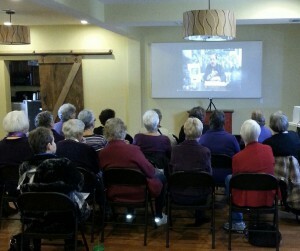 The Network brings remarkable people and programs to retired adults. From the comfort of their senior center, they can visit behind the scenes of the ballet and talk to dancers about their current performance or career, talk to the National Archives staff on research in genealogy, interact with authors to discuss their books and writing style, learn from scientists why they are trying to replicate spider silk, and any other place or person they want to see. Senior Learning Network has a variety of programs in addition to their core offering of distance learning from senior centers, including professional development for their member centers, study groups, and book clubs – all over Zoom. How Does Zoom Fit In? Good question! To support these programs and centers, Senior Learning Network purchased their own server and began testing video conferencing software. They had mixed results with their first few attempts. Lynne also noted that some of the museums they work with liked the experience so much they are switching over to Zoom too. As for the big picture, Ellen said, “We want to take lifelong learning to anywhere throughout the world! Senior Learning Network offers 600 programs – either free or highly affordable – from theirwebsite. They currently serve about 25 centers across the US, but by January 2015 they expect to bring on another 25 centers. Additionally, they are currently piloting a program with six members who are joining the educational experiences from their own homes via Zoom. If this works, Senior Learning Network could increase their user base to include those who do not have the ability or desire to leave their homes. Finally, they’re hosting fundraisers over Zoom for their rural constituents to help them pay for the modest Senior Learning Network program fees. We plan to check back in with Ellen and Lynne in 2015 to see how they’ve progressed on these plans. Stay tuned!